Jeffer Mangels Butler & Mitchell LLP (JMBM) professionals are scaling more than legal heights these days. 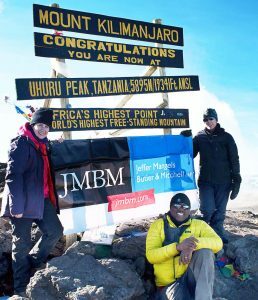 Land use Partner Sheri Bonstelle, intellectual property litigation Partner Rachel Capoccia, and IT Project Manager Maurice Oketch conquered Mount Kilimanjaro – known as the “Roof of Africa” – in February, reaching Uhuru Peak at 19,341 feet after a 6 1/2-day uphill trek. The three spent 8 months conditioning before the trip hiking peaks in Southern California, including Mt. Baldy and Muir Peak. Capoccia, Oketch and Bonstelle at the peak of Kilimanjaro. What’s next for the adventurous travelers? “My next trip is in the opposite direction – scuba diving in the Philippines.” said Capoccia. “But I’m definitely planning more high-altitude hiking in the future.” Bonstelle is hoping her next trip will be trekking in Nepal to Everest Base Camp. Oketch grew up in Kenya and has organized numerous wildlife safaris and other trips to Africa, returning to the continent twice a year. While he has been to Tanzania’s Kilimanjaro National Park a number of times, this was his first trek up Kilimanjaro, the tallest mountain in Africa.